Why Do Pedestrians Have to Press “Beg Buttons” to Cross the Street? We were all taught how to cross a street: Look both ways. But, in some cities, you'll also have to ask permission by pressing a tiny button and waiting your turn. Those little buttons on walk signals have been nicknamed "beg buttons"—because walkers are pretty much begging to be able to cross. Here in Los Angeles, if you don't press them, you won't even get the opportunity to cross—the light will turn red, stopping the opposing traffic, but you'll never get a walk signal and the light won't stay green long enough for you to actually make it to the other side. But the problem, especially in L.A., is that jaywalking is not only defined as running across the street mid-block without a signal—you can also get a ticket for stepping off the curb at a signal after the "countdown" starts. This is not to say that people don't cross the street illegally—they definitely do. And who hasn't tried to beat the clock by running across the street before that countdown runs out? The problem with beg buttons is that they criminalize walkers—they provide a very specific way for police to blame pedestrians for an uptick in collisions. Those humans in Los Angeles who began walking a second or two after the light was blinking were, after all, violating the "Vehicle Code." Note that cars, apparently, do not violate a "Human Code." As for pedestrian safety, which is the typical stated purpose of jaywalking crackdowns, more pedestrians generally are killed in urban areas by cars violating their right of way than are rogue pedestrians violating vehicles' right of way. Then there are those people struck on sidewalks, even inside restaurants. What do we call that? Jay-living? There are some solutions which can help turn this misguided attitude around. In D.C., for example, instead of cracking down on deviant pedestrians, cameras have been installed at intersections specifically to catch drivers who "block intersections, roll through stop signs, fail to yield to pedestrians, pass through an intersection at an unsafe speed or take an oversize bus or truck on a street too small to accommodate it." The fines for blocking an intersection or rolling through a stop sign are $50—still far lower than the jaywalking ticket you might get in other cities. But it's a step in the right direction: Law enforcement is targeting the entity that's most likely to do the most harm. Another option is to give the pedestrian a few extra seconds to cross, what planners call a "leading pedestrian interval" or LPI. Here, walk signals give pedestrians a five second head start before the cars crossing with them get the green light. This not only gives extra time to cross the street—especially important for wide streets and elderly residents or people with wheelchairs or strollers—it allows the pedestrians to get out into the streets and be more visible before the cars start driving through, preventing collisions from right turns. This solution is great: it doesn't require any additional infrastructure, just a reprogramming of the signal's schedule. We should also look at redesigning the intersections themselves. There has been a resurgence in the crosswalks called pedestrian scrambles which stop all vehicular traffic (even right turns) and allow walkers to cross in all directions, including diagonally, which is the safest and most effective way to get pedestrians across the street. If you look at the intersection above, which is Oxford Circus in London, you'll see that not only do the signals stop all traffic, but the pedestrian paths themselves are highlighted with paint and reflectors. This clearly delineates the path that's for walkers and makes them feel better about crossing. It redesigns the intersection for pedestrians, as it should be. Scrambles aren't the only way to make walkers safer, and many of the best solutions draw from a variety of improvements. In New York City last night, the DOT revealed a comprehensive pedestrian safety redesign for a deadly intersection on the Upper West Side that included a shorter wait for pedestrians, limited left turns, and a redesigned crosswalk. Designing more visible crosswalks is a pretty simple thing to do, but most cities likely won't embark upon massive pedestrian signaling improvements until there's a particular density of walkers to use them. The reason beg buttons have been phased out in cities like New York is because there's a high number of walkers at pretty much any intersection. If another city made an announcement to remove their beg buttons, I have a feeling we'd hear from frustrated drivers who would complain that their time stopped at a light will be longer because they'll have to wait, even when no pedestrians are present. 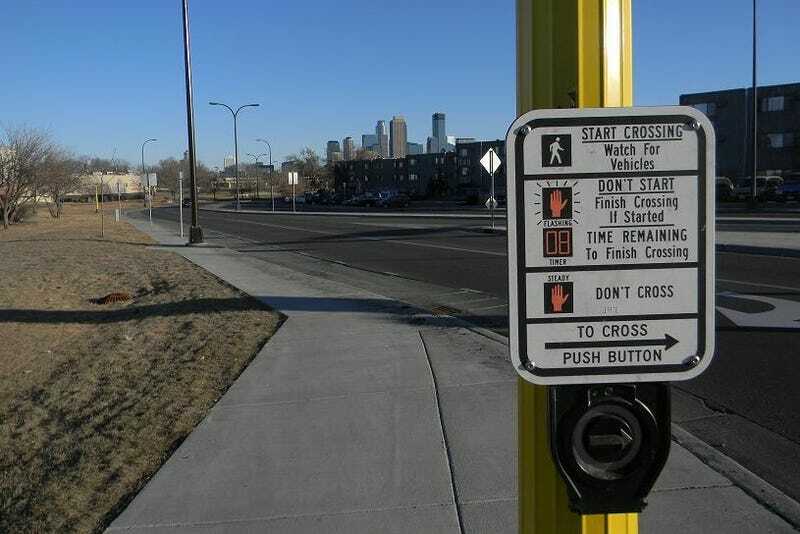 There are other technologies that can help circumvent this problem, like sensors that will activate a walk signal without having to press a button, but that still enforces the divide between car vs. pedestrian—and it will cost cities more money to install. So how about reducing the number of signals? There have been studies that show signaling actually makes drivers less mindful of their surroundings; they're more likely to pay attention to pedestrians and other obstacles at stop signs, when they'll have to take an active role in deciding when to stop and go. And signal-free roundabouts have been shown to offer vast improvements when it comes to mitigating traffic flow and reducing pedestrian collisions. Of course, this is not an option for very, very busy intersections, but you've likely experienced why this is a better solution for yourself while crossing smaller streets. A stop sign allows the driver and walker to make eye contact and engage in a dialogue of sorts, agreeing to keep each other safe. And that's exactly what we should be doing: making everyone on the street feel safe and acknowledged.